Let’s face it – it feels like the earth is basically melting beneath our feet these days. Not only do we have to worry about hydration and wildfires, but now we get to add immanent death to the list. But nothing can beat the heat more than a dip in the pool. Your pool, a community pool or a good friend’s pool are the best meeting points for summer fun. But amidst all that fun we need to make sure we are also safe. 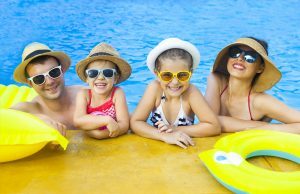 After all, pool and spa submersions and drownings happen quickly, especially when they involve children. And believe it or not, but a child can drown in the time it takes to answer a telephone. Be alert to the hazards of drownings, non-fatal submersion injuries and drain entrapments — and how to prevent them. If you would like to learn more about pool safety, contact Simple Acts of Care and Kindness at 866-459-7225 or visit www.simpleacts.org for additional information.